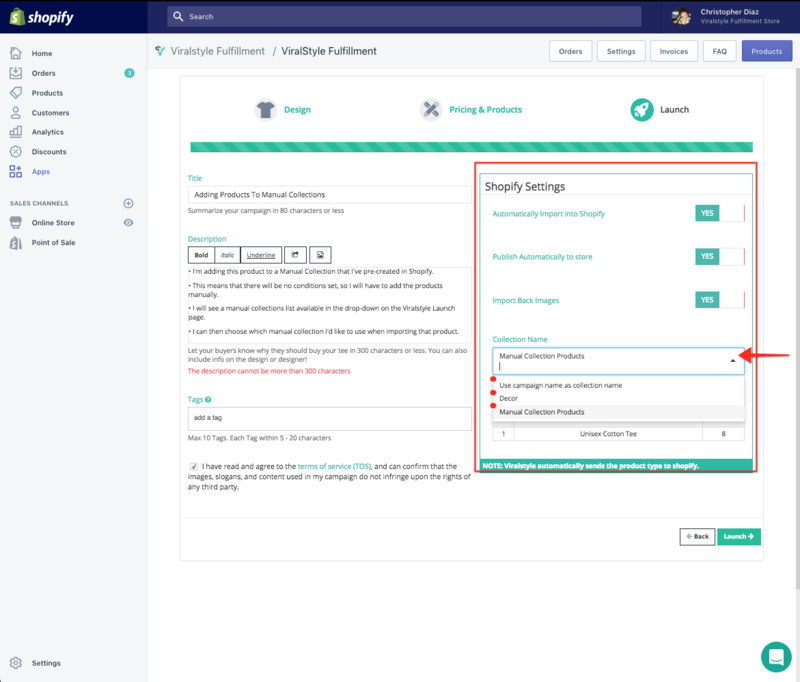 When launching products into Shopify using the Viralstyle Fulfillment app, there are several ways to choose which collection that product will be assigned/added to. When creating a collection on Shopify you have 2 options, Manual collections & Automated collections. Please visit the Shopify Help Center (links below) to learn more about creating each type. We have created a quick & easy guide below, showing you how to use these collection types, with the Viralstyle Fulfillment app when launching your products. Note: You can't change an automatic collection to a manual collection. Instead, create a new manual collection and add the products that you want. Keep in mind that I'm adding this product to a Manual Collection that I've pre-created on Shopify. On the Viralstyle Launch page you will see a drop-down in the "Shopify Settings" field, this will allow you to choose a Manual Collection name. After adding your title, description & agreeing to terms, please review your Shopify Settings. You will see several toggles that allow you to automatically import & publish this product, LIVE to your storefront. Click the drop-down and select a Manual Collection, then launch the product (bottom-right). An automated collection uses selection conditions to automatically include matching products. You can add as many selection conditions as you like, and you can specify whether products need to meet all conditions or any condition to be included in the collection. Note: If you want to choose specific products for a collection, then you can create a manual collection instead. You can see all the products that have been added to this collection by "Condition", which can be updated at any time. You can set multiple conditions when creating Automatic Collections. This means that any product launched from the Viralstyle App (Vendor), that are not "Decor" will be added to this collection. This means that any product launched through the Viralstyle App, that has the tag "ANY TAG" will be added to this collection. Keep in mind that I've added "Conditions" to my Automatic Collections, which were pre-created on Shopify. Automatic Collections will not appear in the drop-down menu, in the "Shopify Settings" field. On the Viralstyle Launch page you will see a "Tag" field below the Description field. Be sure to add the exact tag that you've used to create the smart collection in this field. Our example was "ANY TAG" (case sensitive), so we'll add this tag and click the "tab" key on our keyboard to proceed. If you are using Vendor Conditions, you do not need to change the "Collection Name" drop-down. Launching the product will automatically assign this product to a collection based on the set conditions. If you have any other questions or concerns, please contact shopify@viralstyle.com.